The restoration of chassis 911 660 9050 has begun. This is one of the very rare 1976 Carrera MFI 2.7 models, also known as a Euro Carrera, that carried on from the 1973 Carrera RS in 1974 through 1976. Porsche produced only 113 of these non-production models all within the last month or so of the 1976 model year. Most Porsche enthusiasts don't even know these exist and very few books have a mention. The chassis numbers for the 1976 MFI 2.7 includes a "9" digit in the sequence number indicating these cars were a special non-production model like the RSR. Further the factory original 911/83 RS spec engines also include an "8" digit in the sequence number (aka 6668XXX) to indicate the engines were a special build not used in normal production cars. Chassis 911 660 9050 was originally delivered via the factory connected and longtime Porsche dealer Glöckler in Frankfurt, Germany. This Carrera originally had black leatherette with red tartan dress inlays, a stunning combination with the silver exterior. It has been sitting for well over a decade in an unrestored state, but is rust free except for the battery box and lower window sills which is where almost every old 911 has rust. The 1976 Carreras were fully galvanized which surely helped in preservation, though this car has had primer roughly applied in the past along with a fair bit of overspray from sitting in body shops. Otherwise the car is very original, appearing to have never suffering accident damage, and almost all the original bits and pieces are there necessary for ensuring this is correctly restored. However I do need to source an original 1976 black dash in good to very good condition as the current one is heavily cracked as well as original speaker covers for the door panels. If you know of any please contact [email protected]. 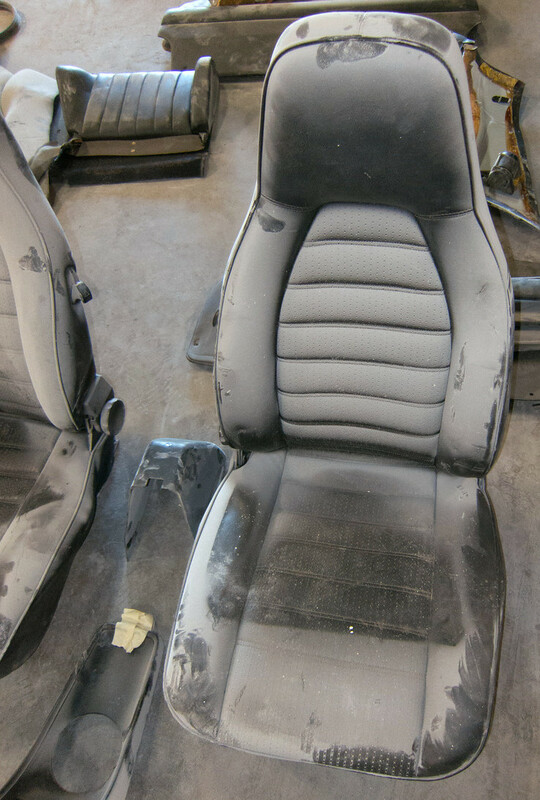 At this point the interior is stripped completely and has been delivered into the good hands of Tony Garcia at Autobahn Interiors in San Diego. We'll catch up with Tony on future posts to share the progress, but after visiting his shop I am extremely excited to be working with him on this project. Fortunately Tony has just enough NOS OEM red tartan material to finish the seat inlays. I'm thankful the car didn't have the full tartan plaid interior (option M392) as it would have been difficult to source more OEM material. The original black needle punch carpets were all in good enough shape to be reused except for a few rips in the vinyl edging. This means we will be able to clean up the carpet and Tony will perform some minor reconditioning including resewing a raw edge vinyl exactly as the factory did in 1976. Stay tuned for future installments covering the restoration of 911 660 9050.